Ike Ekweremadu, Nigeria’s Deputy Senate President is at the EFCC office. Mr Ekweremadu was said to have arrived at the anti-graft agency’s office in Abuja between 9-10:00 a.m.
“He is currently at the interrogation room" a source revealed. 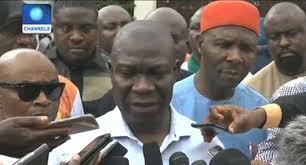 Another EFCC staff also said Mr Ekweremadu is with anti-graft detectives, but could not say when he would be released. Mr Ekweremadu, the most-senior member of the opposition Peoples Democratic Party in public office, was invited for questioning last week Tuesday. Mr Ekweremadu has faced multiple allegations of sharp practices in recent years, including claims that he forged Senate standing rules which led to the controversial election of principal officers in June 2015. Mr Ekweremadu strongly denied all allegations of corruption, alleging political persecution and daring anyone with evidence of sharp practices against him to come forward.